It’s mind boggling to think that mass-produced street-legal electric motorcycles have only existed for 10 years. 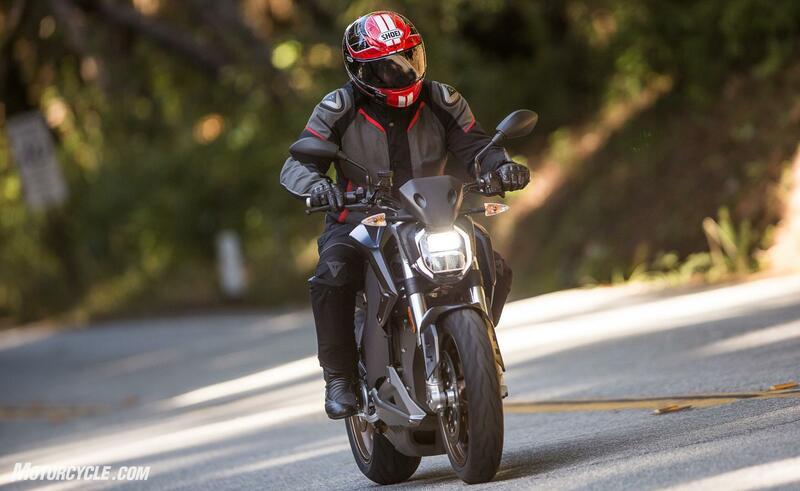 In 2009, Zero Motorcycles launched the Zero S and ushered in the electric age of two-wheeled street-legal transportation. 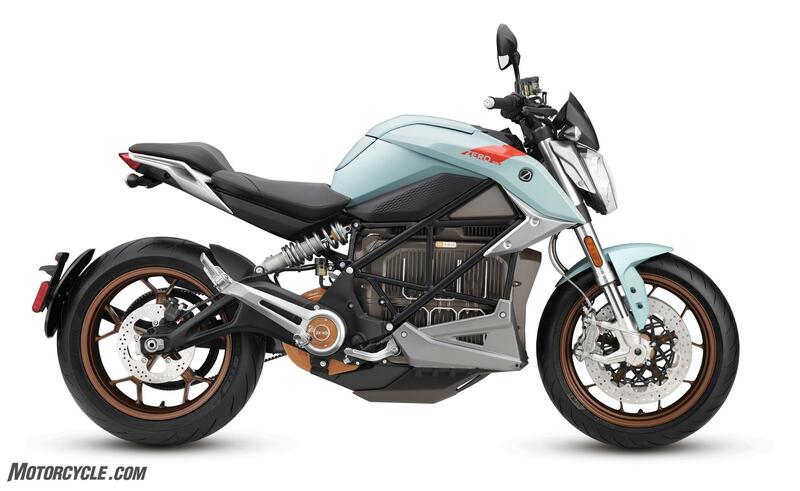 During that model year, the S wasn’t just the only electric motorcycle in production, it was the only electric vehicle of any kind being mass-produced. 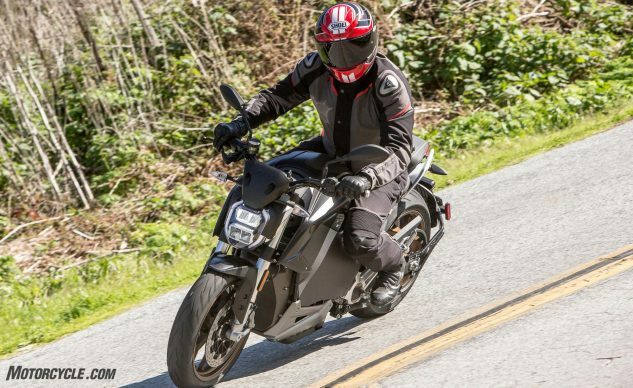 To say that Zero was ahead of the curve is an understatement, but that early start has given the company the time – 13 years from its inception – to develop into its PR claim of being “the global leader in electric motorcycles and powertrains.” If your products created an entire category of vehicles, this is more than PR fluff. It is a demonstrable fact. Other motorcycle manufacturers have noticed the writing on the wall and are entering the market. BMW has its C-Evolution scooter. Energica has created a niche within the boutique electric performance market with the Ego, the Eva, and the Eva Esse Esse 9 – and hit the big time with the FIM naming it the supplier for the five race MotoE series that will tour with MotoGP in 2019. 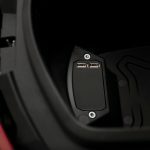 Lightning Motorcycles, the boutique brand whose LS-218 superbike conquered Bonneville and Pikes Peak, has recently announced its Strike model will be unveiled next month, and Harley-Davidson has finally given a launch date – in August as an early 2020 model – for its Livewire. 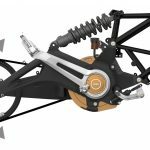 Lest you think that simply producing exciting electric motorcycles guarantees success, consider for a moment the demise of Alta Motors. 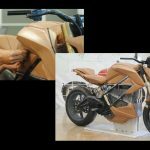 Meanwhile, Zero has been there toughing it out in the trenches longer than any other manufacturer, creating the electric motorcycle market. 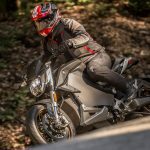 With this as the context, I recently gathered with the representatives of Zero and the editor of a well-known German publication to get an early glimpse of – and ride on – the 2020 Zero SR/F. So, while the rest of the world gets to learn about Zero’s StReetFighter in a press release, MO will be giving you a riding impression. 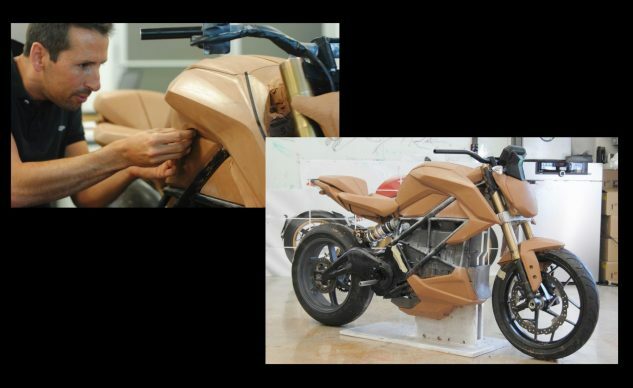 How many motorcycle manufacturers get to say that the bike they are releasing is the one that they’ve always wanted to produce? 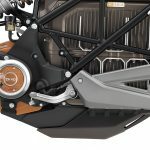 The internal combustion engine (ICE) motorcycle market is so mature and is segmented into niches within niches for marketing purposes that this statement is virtually unheard of. 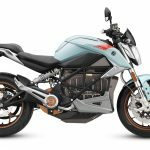 The electric market, however, is still very young, and the SR/F represents the third generation of Zero’s vision of electric motorcycling, the generation where the myriad of requirements for the company’s vision of an electric motorcycle can finally come together. According to Abe Askenazi, Zero Chief Technology Officer, the first generation Zero focused almost exclusively on the powertrain. The primary effort, says Askenazi, was spent answering the question: “How do you make an electric powertrain work?” The Zero S released in 2009 was the result. With the SR/F, the decision was to take all they had learned with the first two generations and apply it to a blank sheet of paper. Askenazi sums it up: “This [generation] gave us the ability to get it all from the start: industrial design, mechanical engineering, powertrain engineering, electrical engineering. When we started this project it was all about, now there’s no fences. How do you take advantage of that?” When the dust settled, the only parts shared with the previous generation Zeros were: footpegs, mirrors, turn-signals, e-throttle, handgrips, bar endcaps, wheel-speed sensors and magnets, horn, reflectors, and sidestand-switch. The resulting 2020 Zero SR/F is an offering that looks, to my eye, more like a full-sized motorcycle than any previous offering from Zero. 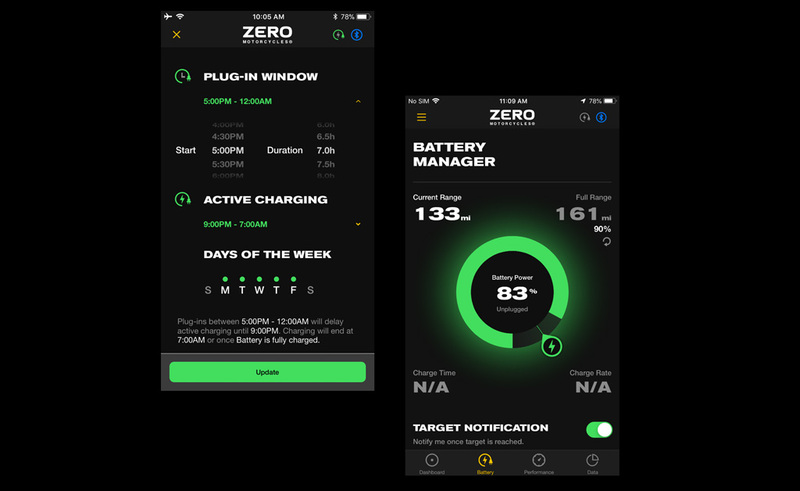 According to Sam Paschel, Zero CEO, the first three things people ask about an electric motorcycle are always: how far will it go, how fast can it go, and how long does it take to recharge? 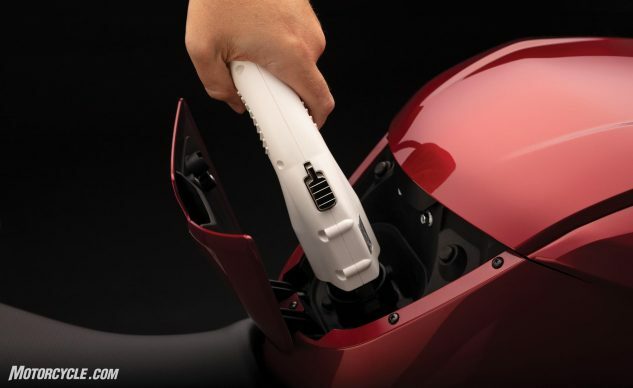 This should come as no surprise to anyone who has even a passing exposure to electric vehicles in general and, more specifically, electric motorcycles because of the size and weight constraints of the two-wheeled platform. 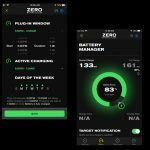 While almost every iteration of Zero’s model line has improved the answer to the first two questions, being stuck to standard 110v outlets on previous generation Zeros meant any improvement in battery capacity was countered by an increase in charge time. 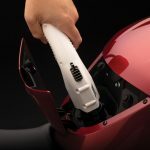 Zero addressed that issue with the accessory Charge Tank Level 2 charger that can fit into the luggage area of the previous generation’s “gas tank” – and you can purchase additional chargers to speed up charge times – but those options are expensive and potentially cumbersome. 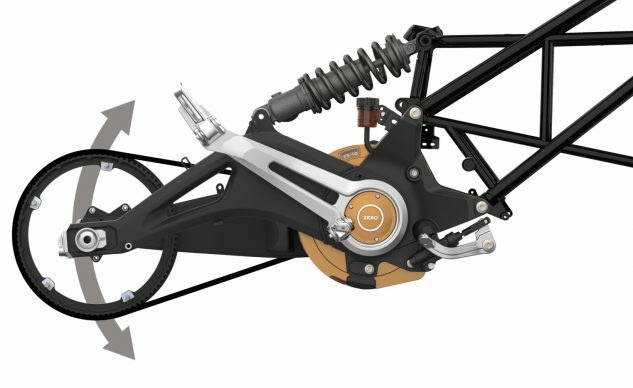 The most elegant fix would be building it into the bike itself. Level 2 charging is standard on the SR/F! For the SR/F, Zero integrated Level 2 charging into the base configuration while, in true Zero form, giving two more powerful Level 2 charging options for people who frequently need to charge on the go. Since the battery capacity retained the 14.4 kWh from the Z-Force Li-Ion integrated battery pack, the 3kW Level 2 charging capability in the standard SR/F dropped the full charge time from 9 hours to 4.5 hours. (Note: Typically, the last 10% of the battery charge takes about a half hour, so a 90-95% charge can be had in about 4 hours.) While the SR/F still comes with an adapter for 110V power to the Level 2 plug, you’ll need to hook the SR/F up to a 220V Level 2 charger to reap the benefits of the charger upgrade. Users who opt for the SR/F Premium will receive the ability to charge their mounts at 6kW, essentially halving the charge time again, to 2.5 hours from 0-100% capacity. Since many Level 2 charging stations offer a maximum of 7kW, the SR/F Premium will be able to take advantage of it. For the super power-hungry SR/F owner, an updated Charge Tank will be available later this year to offer an additional 6kW of capacity, bringing the total to 12kW and allowing a 0-95% charge in just an hour, with a full charge just 30 minutes longer. However, the charging station must be capable of providing that much power – which many are not. The base SR/F gets the forward 3kW charger, and the Premium model gets the one just behind it. An accessory 6kW Charge Tank will be available later. Now, some electro-cognizant readers will want to know why Zero didn’t include Level 3 Fast Charging. Zero’s reasoning was based on the current status of the charging infrastructure in the U.S. (and much of Europe) where 90% of the charging stations are Level 2. With Level 3 stations in their relative infancy, the decision was made to stick with Level 2 – but fast Level 2 – charging. Regarding the Level 3’s potential, Paschel says, “If you look in the future as Level 3 becomes more prominent, of course, we’re going to get our consumers the right solution.” Naturally, I’d assume it would be in the form of an updated Charge Tank. Before I go on, I’d like to make a point about all the worry about charge time. As an electric car owner, my daily experience of charge time is that it is no longer than the time it takes me to plug in a Level 2 cable at night and unplug it in the morning – essentially less than a minute total. Daily users of electric motorcycles would, I assume, have a similar experience. I suppose this would be a good time to mention the SR/F’s claimed range of 161 miles in the city (adding a Power Tank bumps it up to over 200 miles), 82 miles highway, and 109 miles combined. Pat yourself on the back if you noticed that this is about a 10% drop compared to the SR due to higher vehicle weight and larger tires. For more than 90% of my motorcycle use, the claimed range afforded by the SR/F would be plenty. 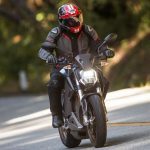 If you’re looking for a bike to only ride in the mountains or tour on the weekends, the SR/F – and any electric motorcycle – isn’t what you’re looking for, anyway. With that said, you can bet that, when I get a test unit in my garage, I’ll subject it to the same ride up the Angeles Crest Highway I do all other electric bikes I encounter just to see how it stands up to sport riding in the mountains. But wait, we’re not done with the battery box yet. If you looked closely at the photos of the SR/F, you noticed that the battery box is significantly less box-like. In fact, it gained cooling fins to its new, cast aluminum structure. An even closer look at the fin density will show that there are more at the center than on the edges of the battery box. The reasoning for this is simple. The pouch cells that make up the battery are in contact with the sides of the box via thermal pads, but the cells at the front and back ends of the box have more exposure to the outside air. The denser fins are to keep the center cells a similar temperature as the end ones. 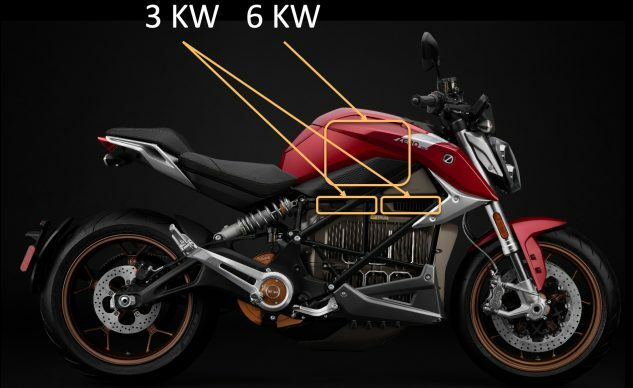 You’ll also note that the fins are vertical rather than horizontal, because they do their work when the bike is stationary for charging. While the battery box is the heaviest component on the SR/F, the motor assembly comes in second. So, it was placed as low and far forward as possible to keep the center-of-gravity low. This placement also allows for the motor to be cooled without fans. Instead, the lower bodywork scoops the air from below the battery box and directs it over both the controller’s and motor’s cooling fins. The SR/F’s motor is a significant upgrade to the previous generation. First, it is 3cm wider, but the new internals are what really count. Additionally, the radial cooling fins allow better airflow and cooling. Finally, the power output has jumped considerably. The ZF75-10 motor puts out 140 lb-ft of torque and 110 hp. The SR/F is the first Zero to produce 100 hp. For comparison, the ZF75-7R motor in the previous generation SR put out 116 lb-ft and 70 hp. Another interesting fact is that the ZF75-10 achieves its new top speed of 124 mph thanks to not only the bump in power from the motor, but also a 1,000 rpm increase in the motor’s top rpm to 7,500 rpm. 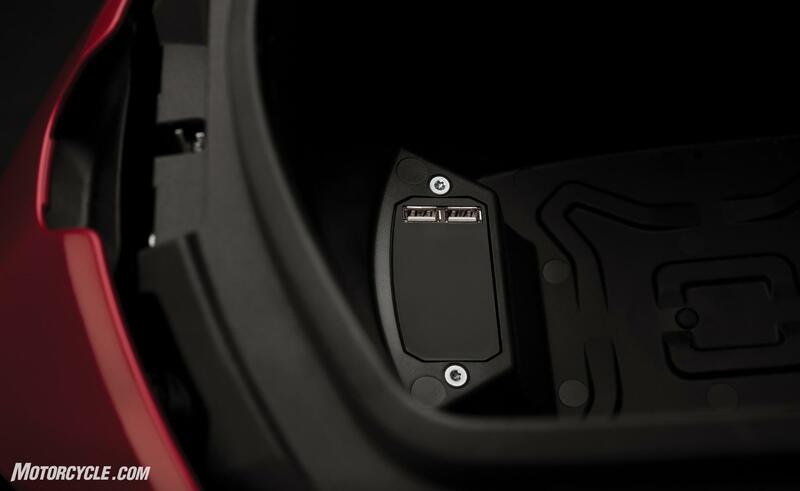 When producing that kind of horsepower and torque, the controller draws 900 amps from the battery. To make sure the battery isn’t stressed under a full load from the controller and motor, the battery pack itself is capable of producing 1,200 amps. In order to handle the heat generated by this level of power, the motor’s internals are “potted” in a thermal compound that surrounds the actual copper windings on the stator and bridges the space to the motor’s casing, which, in turn, provides an efficient path for the heat to travel out to the cooling fins. Radial cooling fins and a shapely swingarm. We’ll discuss the unique pivot soon. 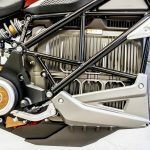 One of the most interesting features of the motor is the fact that the direct drive shaft of the motor is also the point around which the swingarm pivots. Dubbed the Power Pivot by the development team, this coaxial pivot serves two purposes. First, it allows the motorcycle to be very narrow, making the reach to the ground easier for shorter riders. 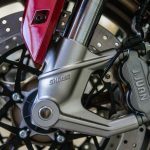 Second, by having the swingarm pivot around the motor’s drive shaft, the tension on the pulleys remains the same throughout the suspension’s stroke. This way the belt can have a very high tension to eliminate any lash from the driveline. 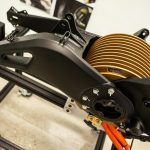 With the swingarm’s unique relationship with the motor, it should come as no surprise that the motor and battery box are both stressed members. 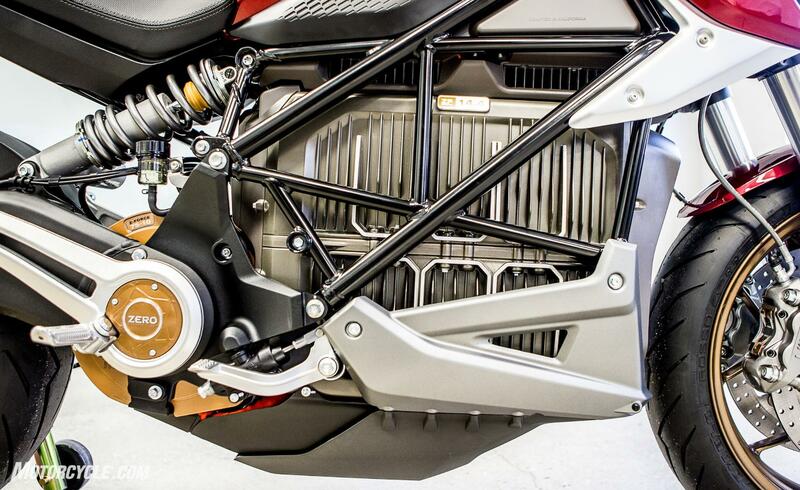 A steel trellis frame wraps around the battery box, reaching between the motor and the headstock. From there, a fully-adjustable big-piston SFF Showa fork reaches down to the 3.50 x 17-inch front wheel. Out back, a fully-adjustable shock interacts directly with the shapely steel swingarm. Both cast aluminum wheels receive Pirelli Diablo Rosso III – 120/70-17 in the front and 180/55-17 in the rear – another step up in sizing when compared to the previous generation SR.
Braking is handled by J.Juan componentry. The radial-mount, four-piston front calipers squeeze 320mm discs on custom carriers that mimic the design of the wheels. The rear brake is a 240mm unit that mates to a single-piston floating caliper. We’ll cover the ABS in more detail in a minute. 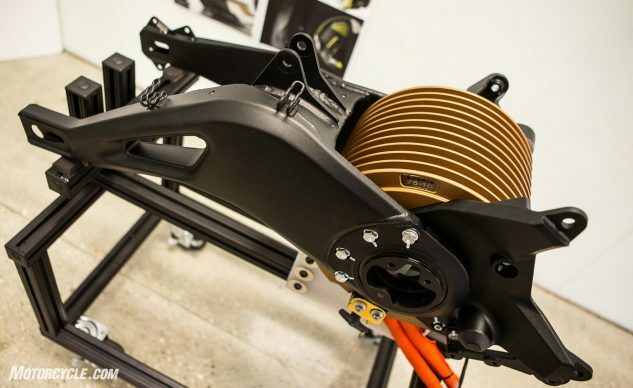 The cast aluminum subframe holds the seat 30.3-inches high and houses a lithium ion 12V battery. Yes, the SR/F has a 12V battery to power the on-board systems. Previously, having the only power source being the 100V battery added a layer of complexity that was unnecessary. With the SR/F, the 12V battery acts as a buffer to the system powering the electronics while the 100V battery monitors the 12V battery and charges it as required. To control the combination of interrelated systems that are contained in the SR/F, Zero’s engineers created the Cypher III operating system to act as the central hub. Cypher III integrates the 12V system, charging system, battery and battery monitoring system, controller and motor, Bosch Motorcycle Stability Control, TFT dash, app bluetooth connection, and cellular connectivity module. Phew! 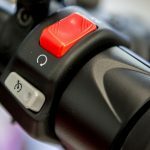 That’s not a starter button below the kill switch; it’s cruise control. 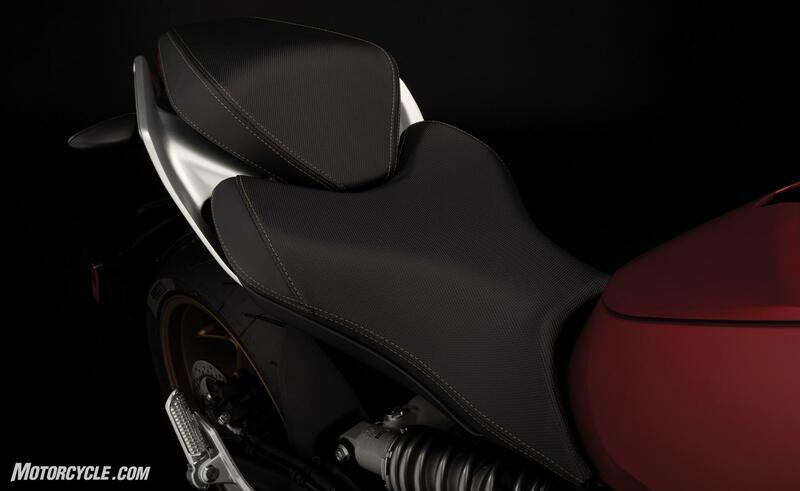 Also, the Premium model includes heated grips. 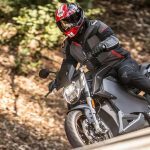 The Bosch MSC is a first in an electric motorcycle. 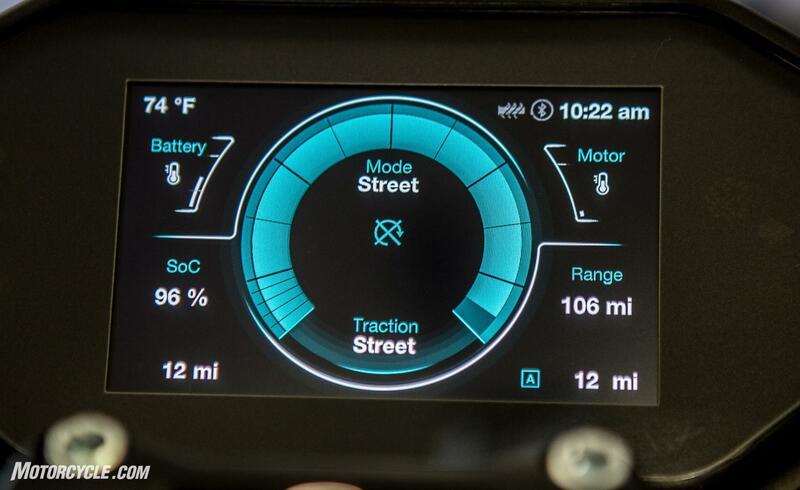 The MSC hits all of the major dynamic controls: ABS, cornering ABS, traction control, drag torque control – all of which are adjustable via the preset ride modes (Eco, Street, Sport, and Rain) and the 10 user-programmable custom ride modes. 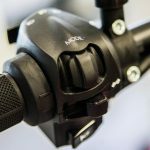 Using proprietary TFT instrumentation, the ride mode parameters can be accessed via an intuitive menu system controlled by a switch on the left grip, or as Zero has done with previous models, the settings can be massaged on the newly updated smartphone app. 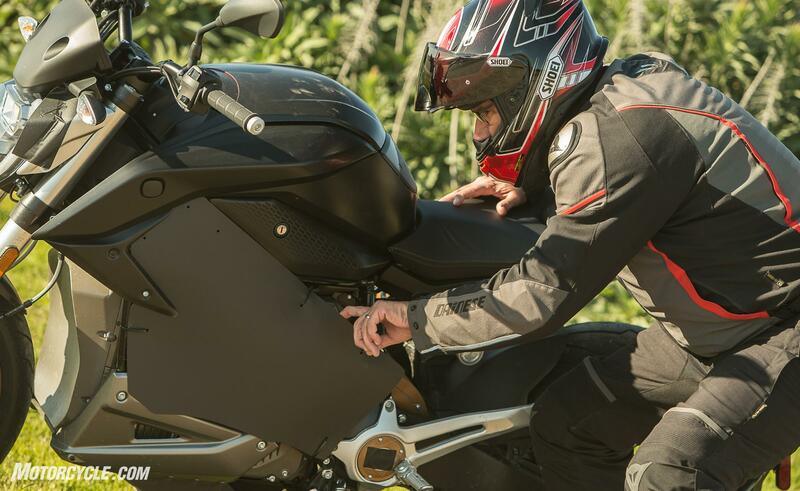 Zero, working with Starcom Systems, has created the first commercially available connected motorcycle. 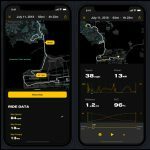 This cloud-based cellular system allows the rider to remotely interact with their SR/F in five key areas: bike status + alerts, charging parameters, “ride relive & share,” customized user interface, and system updates. 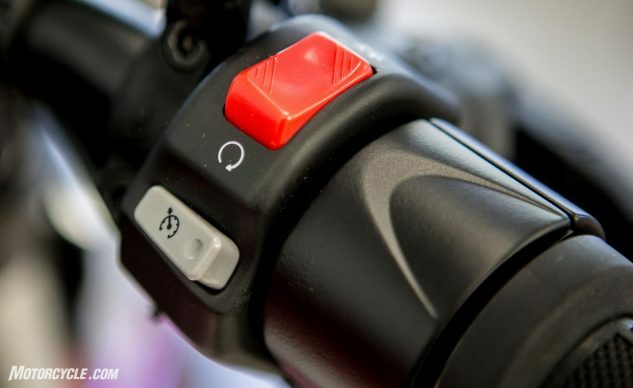 The bike status connectivity includes information like Find My Bike, bike statistics, state-of-charge (SOC), charging info, time to complete charge, available range, and system update. On top of that, the SR/F provides alerts, too. So, the rider would be informed if someone is tampering with their parked bike, charging is complete or interrupted, low SOC during storage, very low SOC, and new system update available. Additionally, the rider will be able to set a notification for when the SR/F reaches a desired SOC (say for a ride home) or designate times to begin charging to take advantage of off-peak electrical rates. 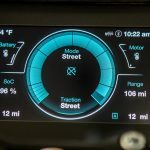 Other customizable remote features are the ability to set up desired dash layout and colors or, as previously mentioned, create custom ride modes via the phone app. Since the cloud-based connectivity makes the SR/F part of the Internet of Things, Zero has included a social sharing capability within the app. 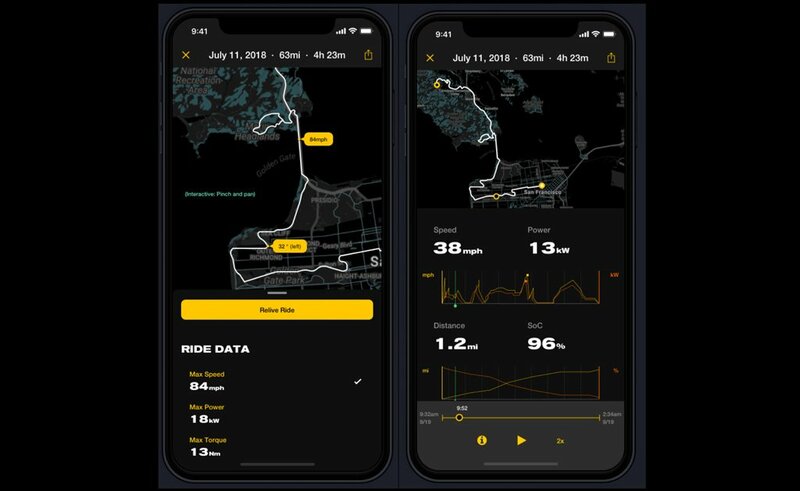 After recording a ride, the information can be shared with other riders down to as granular a level as the rider desires. Everything from the route to the lean angle and speed at every point along the ride can be shared, if so desired, allowing the rider to relive the ride. Riders also have the option of keeping all their information anonymous and can be comfortable with the knowledge that no one is tracking their riding or utilizing their information without their explicit permission. After the tech briefing, Zero provided us with a pair of SR/F Premiums fresh off of the production line in the company’s Scotts Valley, California facility. The roads around Scotts Valley and Santa Cruz are made for motorcycling. So, after a short stint to get out of town, we landed on some proper testing roads. Even with the bodywork spray painted black and the battery box covered, the SR/F is a sharp looking motorcycle. My first impression of the SR/F was that it looked more like a full-sized motorcycle than the previous generation SRs and DSRs. Nothing against them, but throwing a leg over my mount confirmed my thoughts. The look and the feel of the SR/F is that of a machine cut from whole cloth. It feels like a unified whole, and the riding position and reach to the ground were in line with other street fighter motorcycles. In Street mode, the throttle response is quick but not abrupt. The acceleration curve (or is it power delivery curve?) does not reach full power, like the Sport mode allows, but only an extended period at full-throttle makes it obvious. 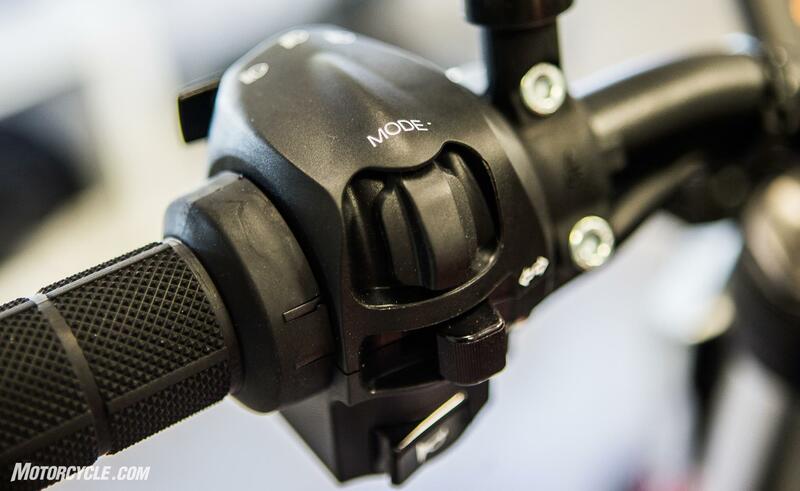 The generous torque available off the line is perfect for most road use situations. For the record, both modes have different MSC settings geared towards typical road use and more aggressive riding, respectively. Instant acceleration is exactly what one expects from an electric motorcycle. The SR/F doesn’t disappoint. It is strong throughout the rpm range. Yes, if you’re used to riding an ICE motorcycle with a peaky power band, you may miss the moment when the bike seems to jump into light speed, but what you gain at every other speed with the SR/F is well worth it. Instant torque is addicting. On our test ride, I was able to take a short blast up to the 124 mph top speed. Since the speed is limited by software, there is no fall off in power before the limit is reached. You simply arrive at 124 mph and stay there. All you hear on the naked SR/F at this speed is the wind, while lower speeds are accompanied by a futuristic whine that I find pleasant. With a slightly canted forward riding position and its formidable power output, the SR/F is a perfect mount for a tight, winding road. The steering is neutral, and neither trail braking nor braking mid-corner upset the SR/F from its line. The wide handlebar offers plenty of leverage for scything your way through a series of corners. The roads we were on ranged from billiard table smooth to extremely bumpy. While almost every bike works well on the smooth stuff, I was impressed with how well the Showa suspension soaked up the rough roads – sometimes with bumps mid-corner. Although different sized riders will want to fiddle with the suspension adjustments, the baseline settings were just about perfect for my 195 lb. frame. 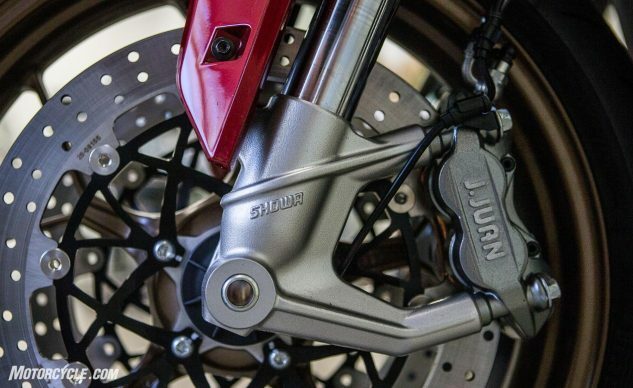 When it’s time to slow down, the J.Juan brakes offer good power and tons of feel at the lever. Although the roads were dirty after the recent rains, I never felt the tires slip under braking or acceleration. I did try a massive burnout in gravel, and after spinning the rear tire for a fraction of a second, the SR/F simply motored its way out of the gravel. Very cool traction control. My biggest complaint about my test ride on the SR/F was that it was too short, but that is what happens when an exclusive ride gets put together on an extremely tight schedule. Our ride was approximately 70 miles, including city traffic, mountain thrashing, repetitive photo shoot passes, a couple high speed sections (including a top speed run), and highway riding. After all of that, we returned with the SOC at 30% – and just begging to be depleted on more winding roads. So, how good is the Zero SR/F? As soon as I got my helmet off after the ride, I was requesting one for a long-term test. There are so many things I want to try with the custom ride modes. I want to take it on my torture ride up Angeles Crest. Mostly, though, I just want to ride the bike and see what it’s like to live with it. 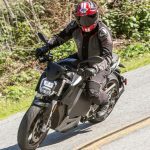 The SR/F is quite simply the best electric motorcycle I’ve ever ridden, and I can’t wait to put it head-to-head with another electric (or two – if they’re available) to explore what the current state-of-the-art is in the electric motorcycle market. The 2020 Zero SR/F comes in two colors, Boardwalk Red and Seabright Blue, and the base model’s MSRP is $18,995. 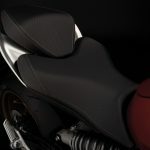 The Premium model bumps the price to $20,995, but for that you get the 6kW Level 2 charger (instead of 3kW), the fly screen, heated grips, and aluminum bar ends. 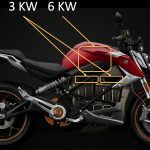 As of press time we don’t know much about the Lightning Strike, but the teasers Lightning have sent so far indicate a motorcycle with similar riding position, and considering Lightning’s sporting pedigree, we expect the Strike to be a high-performance machine. 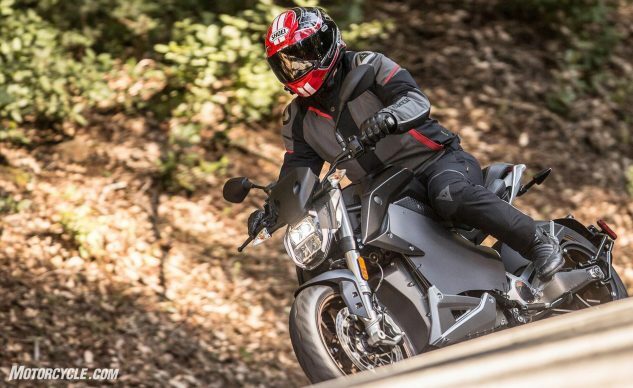 If the hype is to be believed, it should give the SR/F a run for its money, especially with its starting price of $12,998 undercutting the Zero’s significantly. As far as the SR/F is concerned, personally, I’d succumb to the siren song of shorter charge times and opt for the Premium – even if I’d mostly be charging the battery overnight. 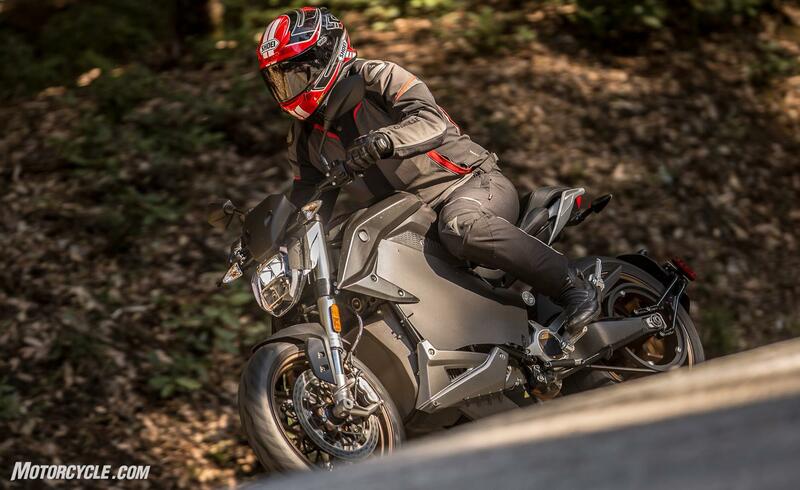 The 2020 Zero SR/F will be arriving in showrooms in April. Fans of electric motorcycles should start lining up for a test ride now. Engine Type Z-Force 75-10 enhanced thermal efficiency, passively air-cooled, interior permanent magnet AC motor. High efficiency and power dense, 900 Amp, 3-phase AC controller with regenerative deceleration. Power System 14.4 kWh, Z-Force® Li-Ion intelligent integrated battery pack.